A soft tissue mass is a relatively frequent presenting symptom with etiologies that range from the benign to the aggressive. 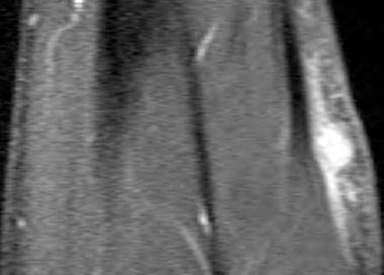 Evaluation begins with a clinical history and physical examination, followed by imaging when the etiology is not readily apparent. 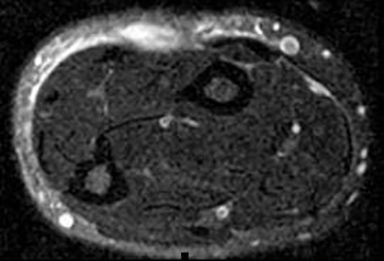 Certain lesions such as lipomas have characteristic imaging features based upon which confident classification can be made by MRI. However, most lesions are not easily distinguished from one another and biopsy is necessary to exclude malignancy. The clinical features such as pain or redness, as well as patient demographics may narrow the differential diagnosis. Nodular fasciitis is a benign soft tissue lesion that is primarily inflammatory in nature and is likely the most common tumor-like lesion misdiagnosed as a sarcoma.1 Histological examination reveals evidence of rapid growth and increased mitotic activity. 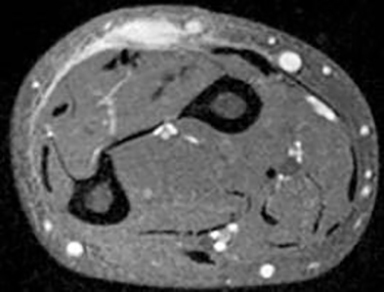 The upper extremity is the most common site of involvement, along with the head and neck in younger patients.2 The presentation of a painful forearm mass in a relatively young patient makes nodular fasciitis a leading consideration in this case. MFH is the most common soft tissue sarcoma of advanced age, though lesions have been described in younger patients as well. An important fact to consider is that the majority are deep lesions with only 5-10% being described in the subcutaneous tissue.6 Whenever an aggressive-appearing soft tissue mass is encountered, the diagnosis of MFH must be considered. Imaging features are nonspecific with variable appearances described on all MRI imaging sequences. The presence of a spontaneous hematoma may further confuse the imaging workup and in such cases it is critical to identify any solid nodular enhancing components of the tumor. Soft tissue masses are relatively common with a confident diagnosis possible in cases of lipoma and in a few select other lesions. Frequently however, benign and malignant lesions overlap in terms of presentation and imaging appearance. In such cases, biopsy and/or excision are necessary to exclude the presence of an aggressive lesion or malignant tumor. Knowledge of the more commonly encountered lesions is necessary to help guide treatment. In this case, the rapid onset of a painful nodule suggests a reactive or inflammatory lesion rather than a typically slow-growing fibromatosis or malignant fibrous histiocytoma. The age of the patient and location are also important clues to the ultimate diagnosis. Finally, the fascial tail demonstrated in this case helps to narrow the differential diagnosis as well. Excision confirmed the diagnosis and no further treatment was required. Kransdorf MJ, Murphey MD. Benign Fibrous and Fibrohistiocytic Tumors. In: Imaging of Soft Tissue Tumors. 2nd ed. Philadelphia PA; Lippincott Williams and Wilkins; 2006:189-191. Kempson RL, Fletcher C, Evans HL et al. Tumors of the Soft Tissues. Bethesda, MD: Armed Forces Institute of Pathology; 2001. Gelfand JM, Mirza N, Kantor J. Nodular Fasciitis. Archives of Dermatology. 2001; 137:719-721. Grobmyer SR, Knapik JA, Foss RM et al. 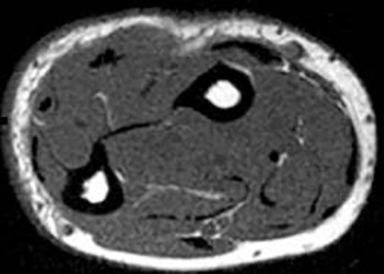 Nodular Fasciitis: Differential Considerations and Current Management Strategies. The American Surgeon. 2009 ; 75:610-614. Fletcher C, Unni K, Mertens F. World Health Organization of Tumors. Pathology and Genetics of Tumors of Soft Tissue and Bone. Lyon, France: IARC Press; 2002. Murphey MD, Gross TM, Rosenthal HG. From the archives of the AFIP. Musculoskeletal malignant fibrous histiocytoma: radiologic-pathologic correlation. Radiographics. 1994;14:807-826. Kransdorf MJ, Murphey MD. Benign Fibrous and Fibrohistiocytic Tumors. In: Imaging of Soft Tissue Tumors. 2nd ed. Philadelphia PA; Lippincott Williams and Wilkins; 2006:217-223. Strickland C. Painful Forearm Mass. J Am Osteopath Coll Radiol. 2012;1(2):32-34. Dr. Strickland works with the Division of Musculoskeletal Imaging, University of Colorado School of Medicine, Aurora, CO.